This is the view you would have from a boat approaching the top of the lift. two 'S' shaped arms, which have two rectangular tanks kept level by wheels running inside a large tracked annular gear connected to the wheel rotating hub via planet gears, each holding 300 tons of water capable of supporting two large boats or four small ones, and because the weight of the boats is not a factor due to water displacement the wheel is in prefect balance even when one carrier is empty. 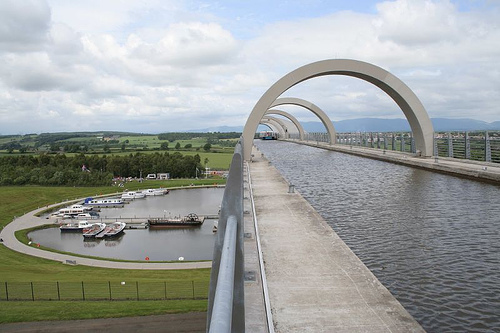 Boats on the Union Canal go through two drop locks and a newly built 168 mtr tunnel to exit onto the 104 mtr concrete aquaduct, then into the carrier and decend the 35 mts to the lagoon at the bottom, in approximately four and a half minutes where a final lock gives entry to the Forth & Clyde Canal. 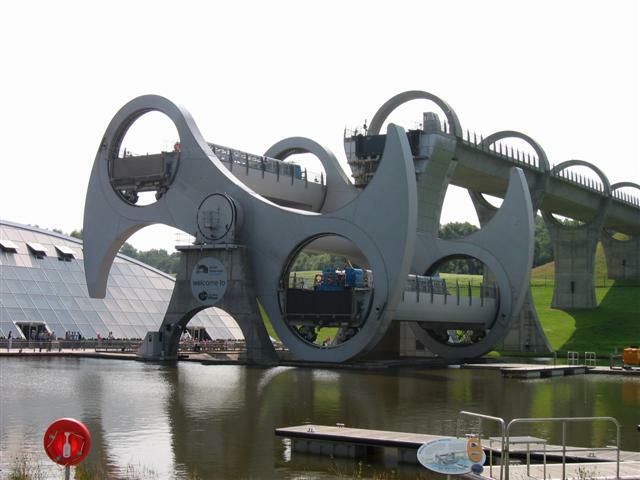 The wheel is turned using 10 geared hydraulic motors supplied by a hydraulic pump driven by a relatively small electric motor and uses very little power because of the equalising effects of the two carriers, and requires only normal routine servicing. 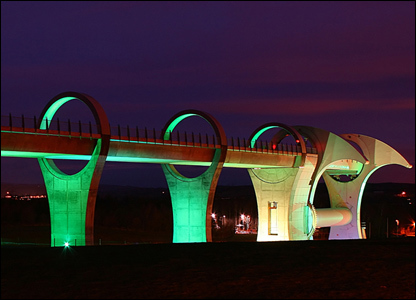 With the raising of the M8 motorway at one point to provide headroom where it had been built over the disused Union Canal and all the bridges and locks needing massive overhauls, the total cost was �.5m of which the Falkirk Wheel accounted for �.5m, lottery funds paid �m money well spent. And while many visitors will be happy simply admiring a remarkable structure designed both to look good and function well, the real experience only comes from trying it out for yourself. Details of boat trips are set out on the website. 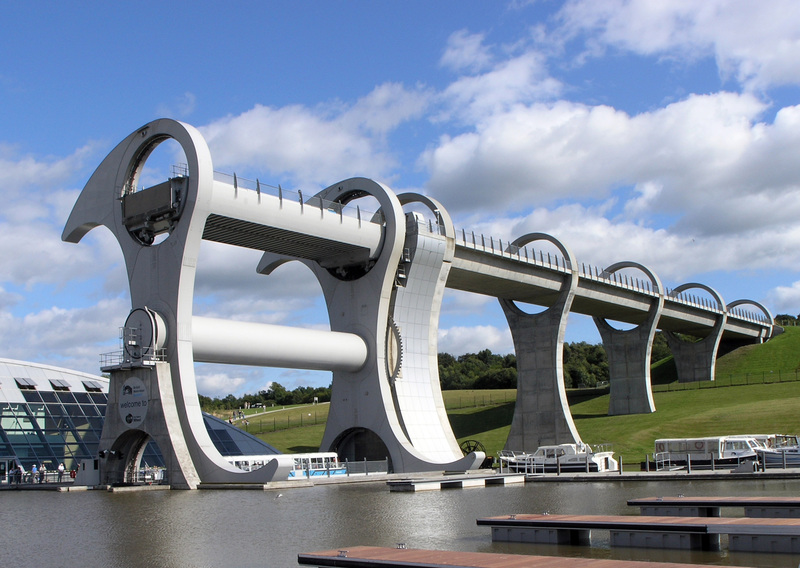 You board your hour long trip in front of the Visitor Centre before being lifted in the wheel to the length of canal through Roughcastle Tunnel. Beyond the tunnel your boat turns, before returning through it and descending via the wheel. Advance booking of boat trips is highly recommended on 08700 500 208 up to 5.00pm the previous day (2.00pm on Sundays).